It almost seems commonplace to see the name Christopher Nolan in the same sentence as the word masterpiece, and that’s for good reason. Nolan has a gift that helps him create films that showcase many of the reasons we go to the movies in the first place. From The Dark Knight trilogy and Inception to Memento and The Prestige, Nolan just has a knack for telling stories in the most engrossing way possible. His latest film, Interstellar (which he co-wrote with his brother Jonathan), is no different. This is Nolan’s first foray into the more classic space-oriented side of the science fiction genre, and he proves here that his creative genius knows no bounds. As a clear fan of his work, I’m well aware that this may sound like a gushing love letter to the director; however, I’d be completely honest if something he made just simply missed the mark in my eyes. 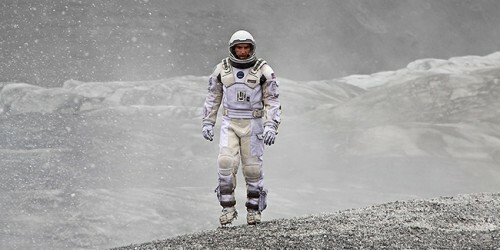 Interstellar is an epic tale about humanity, space travel and the relativity of time. The film takes place in the near future and stars Matthew McConaughey as Cooper, a former pilot for NASA who never got a chance to do anything with that set of skills. You see, at this point in time the Earth has been ravaged by a blight that has destroyed all but one food source: corn. Only fragments of information about the current situation are given out during conversations, such as the fact that there are no more armies and likely a fairly scarce government. It’s clear that a great deal of society have become farmers in an attempt to fend off the extinction of the human race. When Cooper’s daughter, Murphy (Mackenzie Foy), discovers a set of secret messages from what she refers to as a “ghost” in her bedroom, she and Cooper embark on a journey that lead them to the discovery of a secret base being run by what’s left of NASA. It’s here that Cooper meets an old friend in Professor Brand (Michael Caine), as well as his daughter Amelia (Anne Hathaway), and they recruit him for a mission to find another habitable world in a last ditch effort to save the human race. What’s so great about Interstellar is just how well the story is told, and how much attention to detail both Chris and Jonathan gave the actual science when writing the script. The film is based off the works of physicist Kip Thorne, an expert in the field of black holes, wormholes and the likes. Thorne was a scientific advisor for the film, as painstaking measures were taken to assure that what is being seen on screen is as scientifically accurate as could be. That said, they’ve also made sure to deliver it all in terms that us regular folk can easily take in without taking us out of the moment. There’s also a fantastic human element to Interstellar, which comes mainly in the form of the relationship between Cooper and Murphy. Cooper also has a son, Tom (Timothee Chalamet/Casey Affleck), and a father-in-law, Donald (John Lithgow); however, the bond between he and Murph is unparalleled. There are also questions about just how far one would go to save the human race, as well as some great points made that we as a species would do anything for the ones that we love, whereas that’s just not the case when it comes to someone we don’t know. How we don’t see beyond our own reach. While this is pretty common knowledge, the way it’s all brought forth in the film is very well done. While there’s plenty of drama to be found over the course of the film’s almost 3-hour runtime, there’s also an incredible amount of intensity and suspense. When the team first gets through the wormhole, they discover that one of the planet’s they’re supposed to check is closer to the black hole than they originally thought, and thus, one hour on that planet is equal to seven years on Earth. Decisions must be made, and it’s just so fascinating to watch it all play out. On the acting front, everyone brings their A-game. McConaughey carries the load of the film on his shoulders, and makes it look easy; however, the supporting cast is just as strong. Hathaway is superb, and Caine once again nails it. Jessica Chastain comes in midway through as an older Murphy, and proves why she’s one of the top actresses in Hollywood today. Visually, Interstellar is astounding. Much like Inception, Interstellar brings out some masterful visual effects that really make you believe the characters are wherever it is the film says they are, be it the middle of a black hole, or a water planet. The set design here is also magnificent, as it brings the viewer right on board with the characters instead of just sitting them in front of a green screen and calling it a day. While the green screen can work at times, being inside the ship through thick and thin really brings things to another level. Interstellar is a science fiction masterpiece that I believe will hold a high-ranking place in the genre as time continues to judge. If you missed it theatrically, then you missed out on a treat; however, I’m happy to report that Interstellar holds up incredibly well on Blu-ray, and is one of the “must buy” Blu-rays of 2015. The Blu-ray transfer of the film is extremely well done. Visually, the film is sharp, and constantly beautiful. Regardless of if it’s a bright, sunny day, a sandstorm, or the blackness or space, the film always looks clean. Sound choices for Interstellar were made such a big deal of during the film’s theatrical release that I’ll touch on them here. There were complaints of muffled dialogue, or the soundtrack being louder at times than words being spoken, and some felt as though certain aspects of the film were being missed because of it. Nolan defended his choices, and said they were done on purpose, and upon watching the film a second time, it’s clear that any moments when the soundtrack kicks in at incredible volumes is for the emotional impact that it brings. The few times dialogue becomes harder to hear due to this, it’s apparent that the dialogue isn’t important. The immersion into the scene, and what’s happening to the characters at that moment is what’s to be focused on. Overall, this is a wonderful transfer overall, and one of the best Blu-rays of the year. One of the coolest additions to marked Blu-ray cases is a collectible IMAX Film Cell from an actual 70mm film print. I received one that has both McConaughey and Hathaway in it during a pivotal point in the film, so that’s pretty awesome. The film cell is fairly dark, so to get a good view at it I removed it from the cardboard casing and held it up to a light. That worked wonders, but be careful when doing so (I used tweezers) as it’s definitely easy to smudge or do damage to. On the extras front, there’s over three hours of material for fans of the film, and the science behind the film, to enjoy. The Science of Interstellar – This is almost a documentary type approach to looking at the scientific aspect of the film. Coming in at just over 50 minutes in length, this feature has McConaughey narrating as we take a look at the scientific side of Interstellar. Kip Thorne, Christopher and Jonathan Nolan, and others all talk about the making of the film, wanting to make sure the science behind it was strong, as well as other inspirations, such as the search for other habitable planets, and Ken Burns’ The Dust Bowl documentary. This is a fascinating and must watch for all who buy the disc. Inside Interstellar is a package of featurettes that I wish had a “Play All” button. Altogether they come in at just under two hours in length as a whole, so while the Play All option would be nice, it probably wouldn’t be used by many who don’t have a good chunk of time to sit and watch it all at once. Inside Interstellar: Plotting an Interstellar Journey – This one comes in at just under eight minutes in length and focuses on the imagery within the film, filming more than originally thought on IMAX, as well as the original expectations of the story. Inside Interstellar: Life on Cooper’s Farm – This one comes in at just under 10 minutes in length and, not surprisingly, focuses on the farm set used in the film. They talk about shooting outside of Calgary, as well as the set design and what it’s like working with real corn. Inside Interstellar: The Dust – This is one of the shorter pieces, coming in at just under three minutes in length. It’s also one of the dirtier featurettes, as it focuses on the use of real dust on set over adding it digitally! Inside Interstellar: Tars and Case — Two of the more memorable characters in the film, who I didn’t even mention above because the story is just too involving and would take too much time to get into, Tars and Case are robots that accompany Cooper and Brand on their journey. This featurette comes in at just under 10 minutes in length and focuses on the performances behind the characters, as well as bringing them to life both digitally and physically. Inside Interstellar: The Cosmic Sounds of Interstellar – This is an incredibly short featurette, and more of a blip than anything. Coming in at a minute and a half in length, this piece focuses on the films all-important music. Inside Interstellar: The Space Suits – This four and a half minute featurette focuses on the suits used by Cooper and company in the film, how they were designed, and their functionality overall. Inside Interstellar: The Endurance – This piece comes in at just under 10 minutes and focuses on the ship the crew embark on this impossible journey in. We see the design phase, why certain choices were made, as well as a tour of the set itself. Inside Interstellar: Shooting in Iceland: Miller’s Planet/Mann’s Planet – One of the longer featurettes in the package, and rightfully so! This one comes in at almost 13 minutes in length and focuses on the shooting locations for the various planets in the film. If you’re picking and choosing, this is one that should definitely be given a quick watch! Inside Interstellar: The Ranger and The Lander – Another 12-minute featurette that focuses on the sets used primarily throughout the film. We get a tour of both, as well as various looks at their design phases. Inside Interstellar: Miniatures in Space – This five and a half minute featurette looks at the models used throughout the film. I’m not sure why, but I always find these miniatures incredibly fascinating! I guess it’s all just part of that movie-making magic! Inside Interstellar: The Simulation of Zero-G – Another five and a half minute piece that focuses on losing gravity in the film. It’s silly, but sometimes I wonder if working without gravity is something that ironically pulls actors into the roles! Inside Interstellar: Celestial Landmarks – The longest featurette in the pack comes in at just over 13 minutes in length and focuses on the science of the film once again. I never did like science much in school, and I’m not sure if that had to do with having bad teachers, or it not relating to movies. Probably a mix of both! Inside Interstellar: Across All Dimensions and Time – This nine-minute featurette focuses on the climactic point in the film, the science behind it, as well as the execution of the scene. Inside Interstellar: Final Thoughts – If you’re still with me by this point, then kudos! This six-minute featurette finishes it off, with the cast and crews final thoughts on the film, and what they hope it goes on to achieve in the future! Paramount Pictures and Warner Bros. Pictures Present Interstellar. Directed by: Christopher Nolan. Written by: Jonathan and Christopher Nolan. Starring: Matthew McConaughey, Anne Hathaway, Jessica Chastain, John Lithgow, David Gyasi, Wes Bentley, Bill Irwin, Josh Stewart, Mackenzie Foy, Casey Affleck, Michael Caine. Running time: 169 Minutes. Rating: PG. Released on Blu-ray: March 31, 2015.